Our Orange Gift Box with Orange Blossom Honey and eight delicious and beautiful Pearson Ranch oranges, is the ideal gift for any true citrus lover! Get 8 Premium Grade Oranges bursting with delicious tangy juice and delicious flavor! Each beautiful orange is delicately placed in the box, and "nesting" in the center, is our very own Orange Blossom Honey which brings the beautiful light fragrance and rich sweetness of springtime of The San Joaquin Valley right to your table. Whether your adding orange blossom honey to your hot breakfast cereal or your evening tea, discover why some call honey "nature's perfect food". Pearson Ranch set the standard for the world' finest citrus and citrus gifts. We lovingly care for our groves so that you can enjoy the ultimate orange gift giving experience. 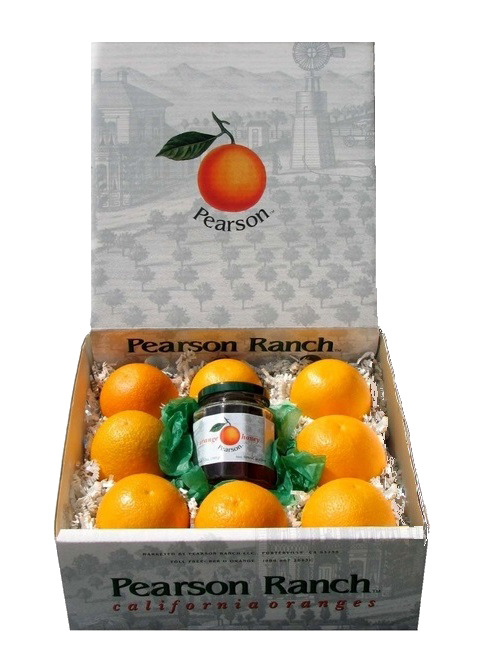 We are currently shipping Navel oranges in our Pearson Ranch gift boxes. For more information please call 1-888-O-ORANGE.